Sticks Wins Folly 2016 Sticks, the project of architects Josh de Sousa (B.Arch. ’04) and Nancy Hou (B.Arch. 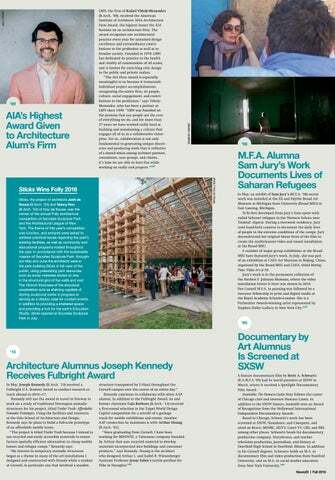 ’04) of Hou de Sousa, was the winner of the annual Folly architecture competition of Socrates Sculpture Park and the Architectural League of New York. The theme of this year’s competition was function, and entrants were asked to address practical issues regarding the park’s existing facilities, as well as community and educational programs hosted throughout the year. In accordance with the sustainable mission of Socrates Sculpture Park, throughout May and June the architects were in the park building Sticks in full view of the public, using preexisting park resources, such as scrap materials stored on site, in the structural grid of the walls and roof. The 18-inch thickness of the structural exoskeleton acts as shelving capable of storing sculptural works in progress or serving as a display case for curated events, in addition to providing a sheltered space and providing a hub for the park’s Education Studio. Sticks opened at Socrates Sculpture Park in July. 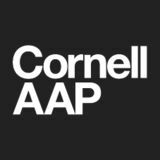 The fall 2016 issue of AAP News, the magazine of Cornell University's College of Architecture, Art, and Planning.